Around the Wherever: My week: January 24 ed. I finished up a busy week, with some surprise reunions and lots of socializing. -I began my week with German lessons and a meeting with my tandem partner. She and I worked on an exercise that was a great mind bender for both of us: I had a list of phrasal verbs in German, which are verbs that use specific prepositions, such as warten + auf (to wait for something). I translated them into English without saying what the English preposition would be. My friend then had to guess the corresponding English preposition, which didn't always align. It was a reasonably hard exercise for me and I was happy to work through such a brain teaser. -I attended a cultural evening about Bangladesh. 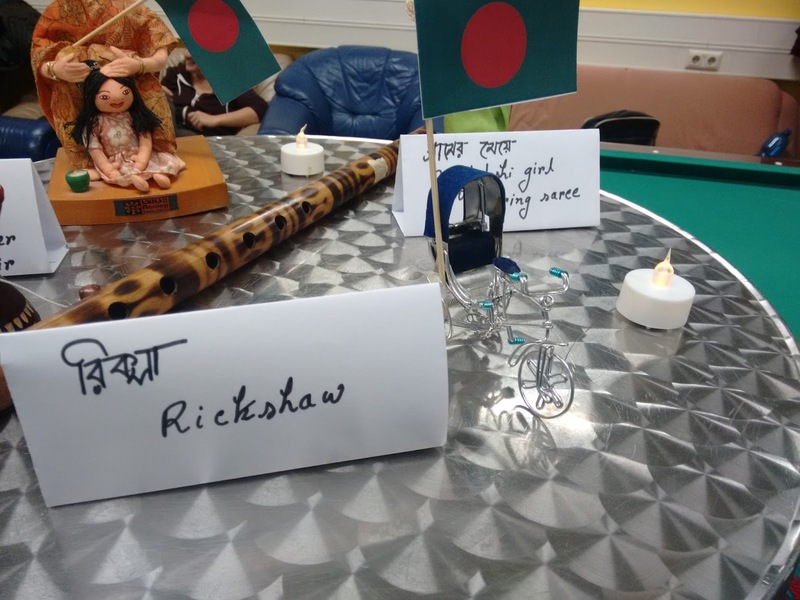 As I entered the room, I was heartily and warmly greeted by a bunch of Bangladeshi guys I know, both from an extended social group and from German classes. My friend K also showed up and we sat together and listened to the presentation about the country and grooved to the song that two of our friends played. I really didn't know much about Bangladesh before. The evening was very informative; I learned that the name of the country basically means country of people who speak Bangla; it was formerly considered East Pakistan (despite being separated from it by almost 900 miles with India in between); and it has a boatload (hehe) of rivers. I also didn't realize that I know so many Bangladeshis! Rickshaw. In one of my German classes, a classmate said that's something he missed from home. We enjoyed a dinner that the students prepared for the guests and caught up with some of our friends. I also met one of K's friends and we chatted him about Brazil since that's where he's from. We grilled him about the Brazilian beef (hehe), the Brazilian educational system, and gauchos. 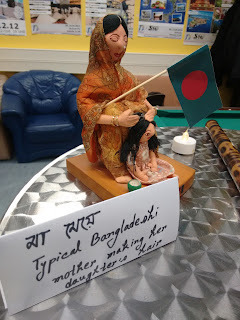 I am amused that we attended a Bangladesh cultural evening and also learned about Brazil while living in Germany. -The vet removed Moo's stitches and by extension, he no longer had to wear the cone of shame. We were both relieved by that! It was funny because every time I take Moo to the vet, both vets say off-handedly how nice he is. Indeed, he is! They're probably relieved to deal with a mellow cat who doesn't bite or scratch. -During the weekend, a group of us visited the Freinsheimer Rotweinwanderung, a hike among the vineyards in the city. Along the way, vendors set up to sell local specialties and of course, red (and some white) wine. I availed myself of the Glühwein since it's a good cold weather drink. 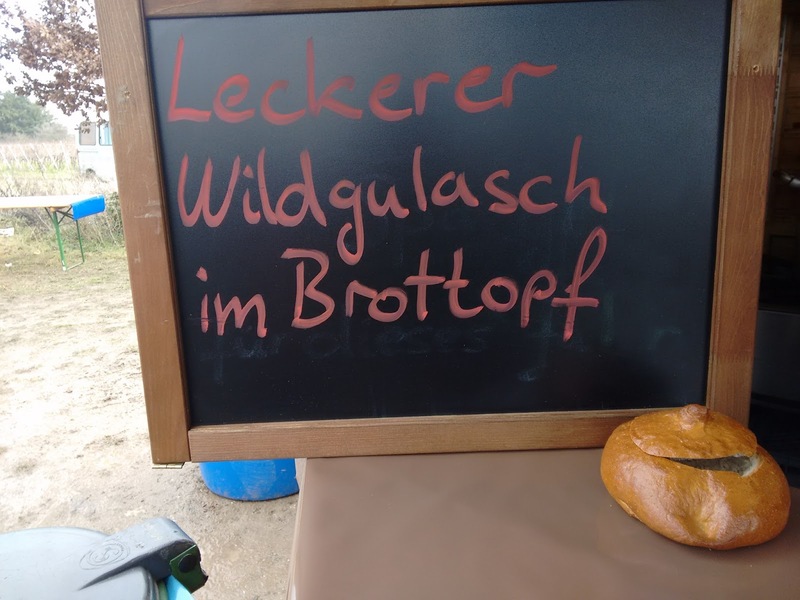 Some of us (mainly myself) got very excited by the "leckerer Wildgulasch im Brottopf" (delicious venison goulash in bread pot) because the bread was actually shaped like a pot and the top like a lid. We giggled and took pictures as the proprietor indulged us; he even held the lid up at one point for pictures. This year, the weather was a bit warmer and there wasn't snow like there was last year. As a result, the paths were a bit muddier but overall it was an enjoyable excursion with some old and new friends.